Phil Jones was granted an average of $120,000 USD per month for 15 years. This email may have been overlooked in the climategate context. Consider the pressure one would be under from the boss when millions of pounds are on the line. I’m just a blogger, but consider the implications of someone writing these words. This email is from Keith Briffa, as pointed out by a reader below and illustrates the pressures climate scientists have to get money. This email discussing his possible ‘unemployment’ for the Hider of the decline (it was keith Briffa’s data with Phil Jones help using the trick to hide the decline). Leads to a second interesting point, first noticed by Lubos Motl. The spreadsheet linked shows Dr. Phillip Climategate Jones didn’t earn the vast majority of his 22 million in grants until after this email. Line 10 in the linked Lubos sheet shows Phil Jones only earned a paultry 104,230 pounds from NERC. or $167,000 dollars at a 1.6 conversion which is applicable in 1998 dollars. Anyone here mind receiving $167,000? IT WAS NOTHING!! 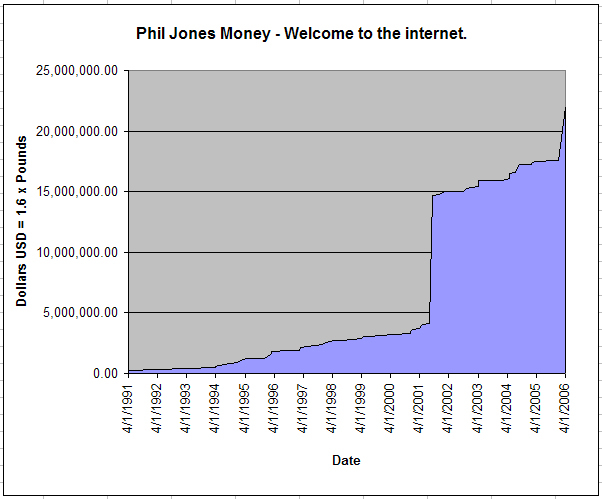 You can see that even the great Phil was going to be fired for raising a mere, 2.5 milion USD in the six years prior to 1998. Imagine what your job would be like if you were forced to raise four times your salary in raw after tax profit, just to keep your gojob. Dr. Phil had no qualms about it and was eventually successful. We should have no doubt that a non-leftist, non-advocate person would fail miserably in the same position. This entry was posted on January 6, 2010 at 1:48 am	and is filed under Uncategorized. You can follow any responses to this entry through the RSS 2.0 feed. You can leave a response, or trackback from your own site. Wow, that’s one hell of a hockey stick he had going on there. Amazing! And exactly how aren’t these people influenced to the point of corruption? I would like someone to very carefully explain this to me. The email you quoted is written by Keith Briffa, not Phil Jones? Surely Briffa is not the “hider of the decline”, etc. #2, I made some change to the text to tie it together better. It was too late to blog last night but the emial caught my interest. The two largest grants apparently inlcuded ‘structural money’ to set up a new institute (ICER) and maintain the Tyndall centre as part of it. I am told too that it is not unusual for UK universities to set targets for grant income per year – for one university in England I have heard two to three times annual salary for an ordinary lecturer. Grant-funded science is a highly competitive business. Only the most skilled at it (and is not to say the most capable scientifically) survive for long. This email helps explain the animosity toward an applecart-upsetter like McIntyre. When one thinks about the NSF money, DoE money, NASA and NOAA money. Office of Naval Research, NSIDC…. all wasted on phoney research, whew! All we need is someone with a conscience in the US. It is very interesting how the Follow-The-Money principle will show the way through the BS. Money is a powerful motivator, and science should not be held hostage to grant hogs. OT: Jeff are you planning a 2010 extreme predictions contest? My point is only that “Climate Research” is a lucrative little business that is fully funded by the government and dependent on the continued belief in a man made crisis. Obviously this money doesn’t go the the researchers only, but it funds their “business” and for that business to continue, the must support AGW. That is what interested me about the spreadsheet. Gavin, I’m sure you’ll cut this, but I respect your efforts to defend RC and don’t question your motives. I am sure you are sincere in your belief in AGW. For reference, BTW in my grad school in the U.S., 65% went to the school. 483. What is so painfully clear from this is how the science of AGW has long since been replaced by the NEED for AGW. You can see it here with Gavin, his responses, can see it all over the community. They need AGW. It is their life. It is their reason of existing. For it to not be what they have claimed means they are not what they claim. It would personally devalue them. What these emails have proven is what many of us have known for some time. These scientists aren’t really scientists. Science requires objectivity and that has been replaced with necessity a long time ago. When you read the cheering of measurements or the frustrations at not getting expected results, it’s a sad statement of where this is. What a sad cast of characters you all are. So sad. Gee, wow, then I guess he’s vindicated. You just don’t get it, RB. Wonder how big his grants would be without AGW? #16, exactly. In my experience, these are some of the biggest grant numbers I’ve seen for a professor. Certainly people do better, but in engineering we were happy when 40K came through. #17, I suspect your familiarity is with non-experimental work. As far as taking Gavin’s word………………..
Any chance we an audit the books !!!! Universities are not much different than the mob (or any other business for that matter!). If you are a good earner, you move up the ladder. If you don’t earn, you get whacked. #20 what Gavin is quoted as saying sounds about right. In the ’60s, I was a research assistant whose salary was funded by a contract/grant with Gov. and although the grant amount looked huge, there were a lot of mouths fed with it. The big hit is overhead and the squirrely part is what your institution provides for their 50% – or more. I can see the innocents aren’t all abroad. some of them are here. too bad. Need to keep focussed on the stuff that is assuredly dubious, not misunderstood housekeeping issues. Jeff, you run a company. Certainly you know the difference between employee cost and what he/she gets in their payroll check. “And note that 50% goes right off the top as overhead” that leaves 410,000 to be split between at least 7 people over 8 years??? If gavin et al do their accounting like they do their “research”, it may put Enron to shame. And, do grad students and do research assistants make much more then minimum wage??? (I don’t know). Nobody is making the claim that these guys are getting rich, but they are doing rather well for them selves. And back to the irony of us septics being in the pockets of big oil !!!!!!!! #24, I agree that “scientific skeptics” are better off making strong arguments on the basis of science. Serious people should be looking at things such as these – such as this one providing CO2 sensitivity to 95% confidence which incidentally turns out to be entirely consistent to within 0.1C sensitivity with other evaluations based on 420 million years of evidence . Arguments which are essentially based on the impossibility of science itself are not scepticism, but instead more akin to denialism. Just another front in the culture wars, I suppose. #23 Gavin’s amount is substantially less than Jones, but it’s not insignificant. Don’t forget, Gavin already works for a fully funded agency. I don’t really have a problem with grant money but consider how hard it would be to get funding from the UN for a non-warming project. Also, consider how the money Gavin and Phil receive give them prestige in their organizations. The amounts Phil Jones has his name on are pretty large. Academics are paid anyway – I don’t believe there is much direct income derived from grants. And that’s still not the point. The point is that the alarmist idiots constantly berate all of us that have skeptical views (as any scientist should, oddly enough) for being in the employ of big oil, yet there is clearly more money being tossed towards the likes of Phil Jones and Michael Mann than any of the rest of us. The hypocrisy is just mind-boggling. Thanks for making that point, Jeff. The grant money is only part of GS’s income, which I’m sure derives from many sources. Not to mention the very expensive NYC location of his office at the GISS (along with boss JH). And, hey, he get’s to blog on the public’s dime to boot! I point this out because, in another area, so-called epidemics, the same strategy is used: ominous overblown predictions about what will happen to the human race unless we stem the tide of West Nile, SARS, bird flu, an imminent smallpox terrorist attack, Swine Flu. Of course, none of those predictions were even close to reality. All these “outbreaks” were duds. But money flowed to the researchers. In a crowded, competing science-research landscape, it has become standard to hype gigantic catastrophes that will overtake us unless…the money for more research pours in. And this doesn’t even to begin to describe who will make out, big-time, on the back end with profits.